So, winter in fact does exist and we will start feeling it soon. . .but for how long? 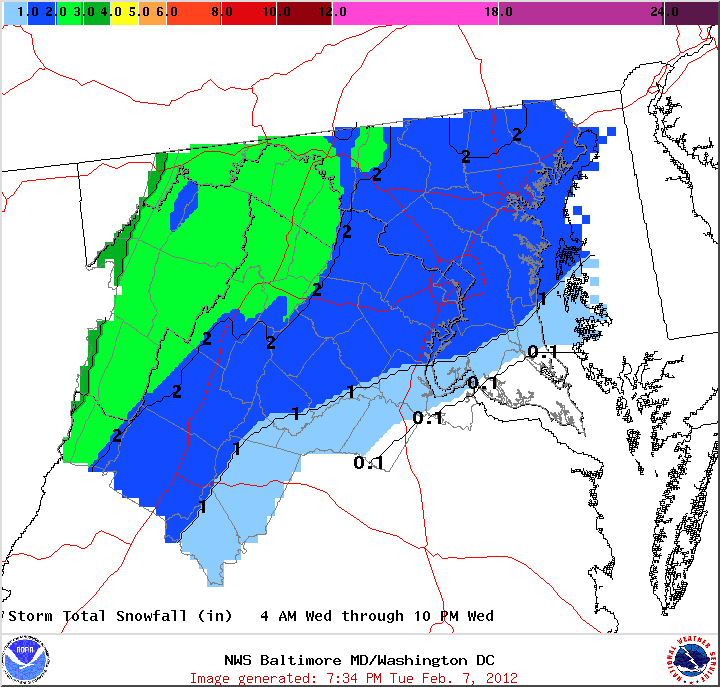 Sterling, VA NWS (LWX) snowfall forecast for 02/08/12. The above map is the snowfall forecast for Wednesday, 02/08/12. This is a small system, but this year the small systems have provided the winter weather. It doesn’t look to be a big event with most areas seeing 1″ or less of snow. Farther north into NJ, you might see up to 1/2″ to maybe 1″, but it’s suspect at best right now. I’d like to see how the system looks going into tomorrow. 18z NAM precipitation and sea-level pressure forecast valid at 7 pm EST on 02/09/12. 18z NAM precipitation and sea-level pressure forecast valid at 10 pm EST on 02/09/12. 18z GFS precipitation and sea-level pressure forecast valid at 7 pm EST on 02/09/12. The above images show the 18z North America Model precipitation and sea-level pressure forecasts valid at 7 pm and 10 pm tomorrow, 02/09/12. Below those images is the 18z Global Forecast System model forecast valid at 7 pm tomorrow. Both models show total liquid equivalent of precipitation around 0.15″-0.30″. This amount of precipitation coupled with temperatures around 33-34F while it’s snowing means light amounts mainly on grassy and elevated surfaces. I would agree with the amounts I presented at the beginning of this entry with maximum amounts around 2″. Where do we go from here you ask? There are signs in the models of a cold and possibly stormier period in the near-future, but I will wait to report on that. The first attempt at true winter is this weekend for most areas, including the Gulf Coast. Side Note: Apparently the tropics don’t know what the calendar says because we had an attempt at a system developing near western Cuba on Sunday-Monday and today I noticed a system southwest of the Mexico in the Eastern Pacific. Neither of these systems developed, but I think it shows how high amounts of moisture is poised to interact with any potential storms. Maybe this is a clue on how winter will end? Time will tell. I hope to have another post the end of this week, unless tomorrow’s storm becomes a bigger deal. tell me, oh expert, will I get to sled this winter in STL?! Also, hope you’re doing well! hi! I think it is still a possibility. . . 🙂 And hi! I hope you are doing well!